1. Start Revit. Under Projects, select Architectural Template. 2. From the QUICK ACCESS TOOLBAR, click on the Default 3D view icon (it looks like a house). 3. On the Architecture tab in the RIBBON, find the Work Plane panel (far right side). Click on Show. 4. On the Architecture tab, Build panel, click Wall. 6. While the Wall command is active, notice that the RIBBON has changed to include a new set of tools. On the Modify | Place Wall tab, from the Draw panel, choose the Rectangle drawing tool. 7. Draw a rectangular enclosure by clicking two corner points on the Work Plane. 8. Choose Architecture > Build > Door. Insert one or more doors in the wall. Notice that Revit restricts how doors can be placed (i. e., doors must be “hosted” by walls). 9. Choose Architecture > Build > Window. Insert one or more windows in the wall. Windows must also be “hosted” by walls. 10. In the PROJECT BROWSER, double-click on the East Elevation view. Use this view to add new Levels (choose Architecture > Datum > Level, or Modify > Modify > Copy), or to change the location of existing Levels. 12. Experiment with switching between views in the PROJECT BROWSER and changing the height of Levels. 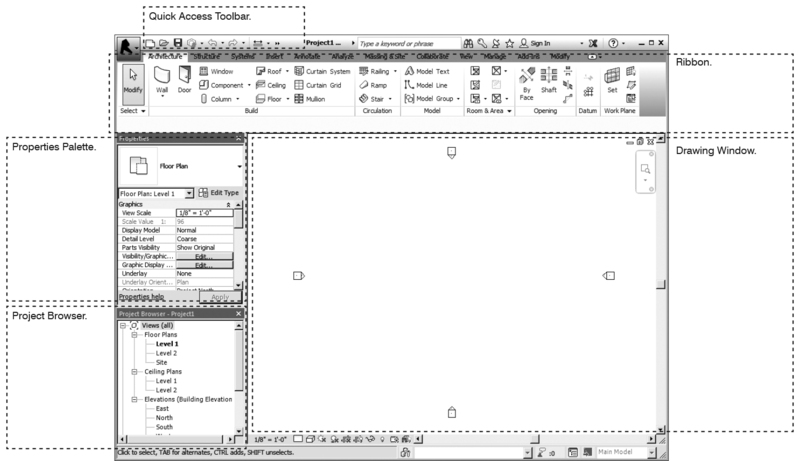 InDesign’s features are accessed through pulldown menus, windows, and keyboard commands. InDesign is a “what you see is what you get” application, meaning that your work appears on-screen as it will fit to paper. This feature contrasts InDesign with Photoshop, where you must perform a preview to see how your work will fit on paper, and with AutoCAD, where formatting (in layout space) is performed separately from drawing (in model space). The Tools window appears automatically when you create a new publication. If you lose the toolbox, choose Window > Tools. The Control window is usually docked at the top of the screen; it is accessed with Window > Control. 1. Choose the Zoom tool from the Tools window. 3. Use the scroll bars on the right and bottom edges of the window to pan across the page. Choose Window > Pages for a preview of the pages in your document. To switch to a certain page within your document, select the page number from the pulldown list near the bottom left corner of the document window.